But there it is. 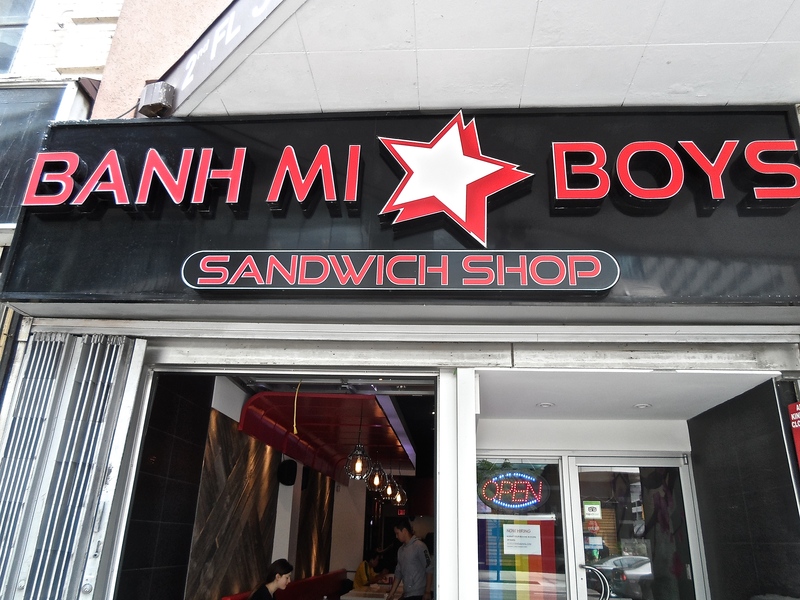 Banh Mi Boys knows how to make good, cheap fast food and do it well. They start with banh mi in ten different varieties encased in buns shorter than the usual super sizes. Their banh mi can be of the traditional type — such as grilled chicken, grilled pork, lemongrass tofu and braised beef — but then it delves into the creative corner. 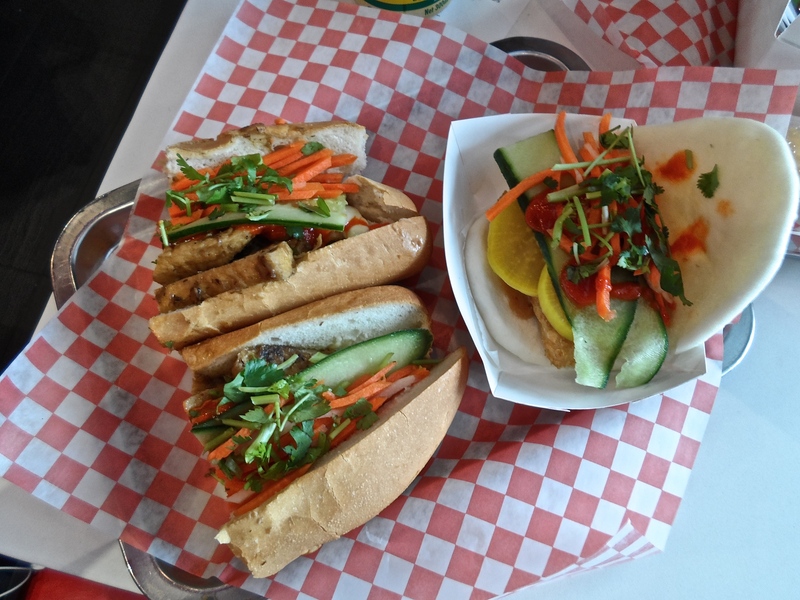 You can also have your banh mi with duck confit (another nod to the French influence), meatball, pulled pork, “five spice pork belly” and kalbi (Korean barbecue) beef, all smothered in pickled carrots, cilantro and cucumber. The Korean factor also moves into the fries territory. Fries with banh mi? Why not? And these are not just ordinary fries but potato fries with toppings of kimchi or tofu, or made with jiacama or sweet potato fries. Can we just a moment to talk about how good kimchi and diner food mix? I’ve already had my liaison with kimchi burgers and, let me tell you, kimchi and mayonnaise are meant to be together. Spicy fermented cabbage on top of thick-sliced fries with a squirt of mayo and garnished with green onions make a great culinary boy band together, even with the accompaniment of tofu. And there is a lot of tofu offerings on the menu for those looking for vegetarian-friendly items and I would highly recommend the panko-crusted, deep-friend tofu in a steamed bun (or bao). 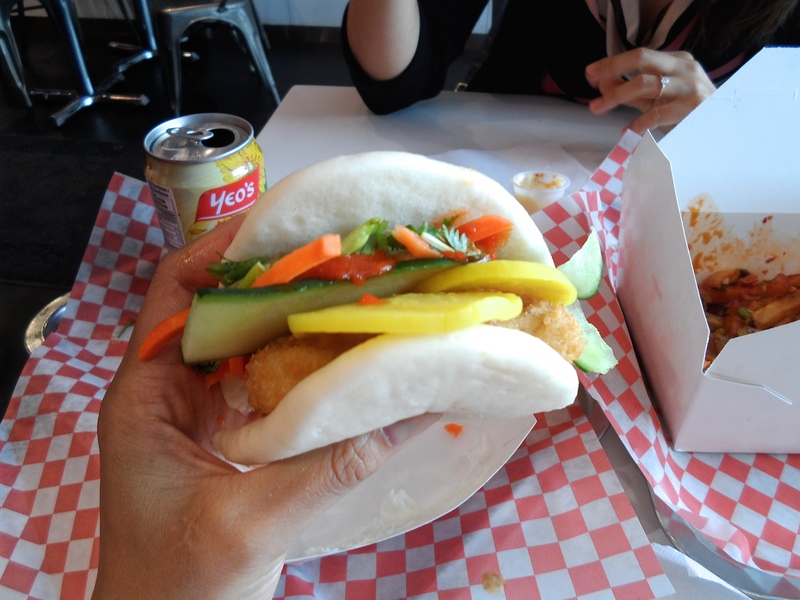 The steamed baos are meant to be little snacks so it’s not a meal in itself, but the crunchy tofu with slices of yellow radishes in between the pillowy wheat buns make you wonder why steamed buns at Canadian a fast food restaurant failed to exist prior to Banh Mi Boys. In addition to the banh mi, steamed buns and fries you can also order their side salads of duck confit or grilled chicken, which we did not try. And of course, tacos. 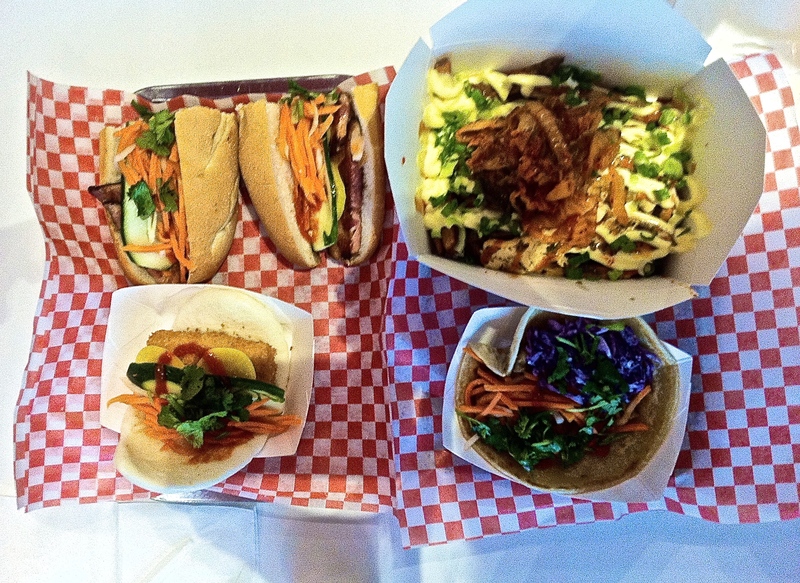 A trendy place like Banh Mi Boys would be foolish not to ride the wave of Asian fusion tacos. 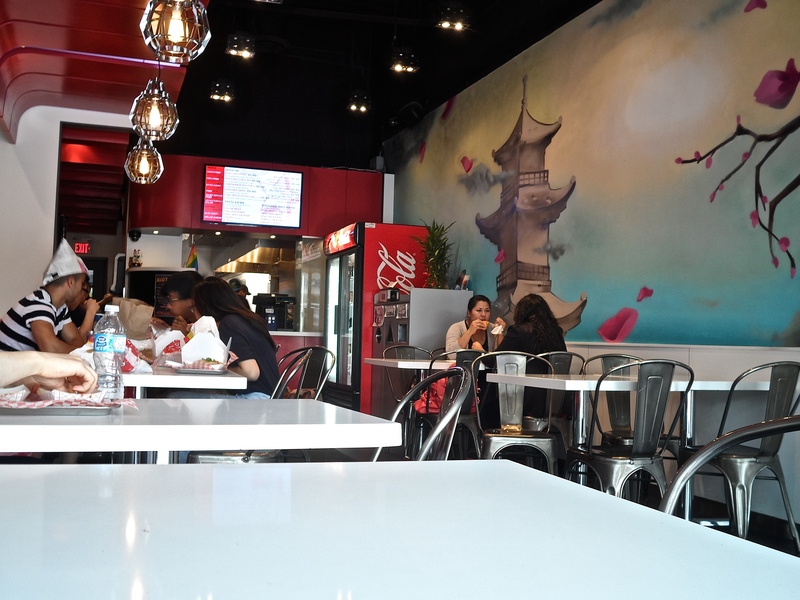 Banh Mi Boys has five offerings: Kalbi beef (Korean food again! ), pulled pork, grilled chicken, squid and tofu. I tried the tofu taco and while it was good, the only critique I had was that all the sandwich-like menu items were starting to taste the same. I mean, the spicing is excellent, the produce fresh, and the execution fantastic, but all the pickled carrots and cilantro was making me taste the exploitation of economies of scale. (Got a great deal on the same ten ingredients? Let’s put them in everything!) 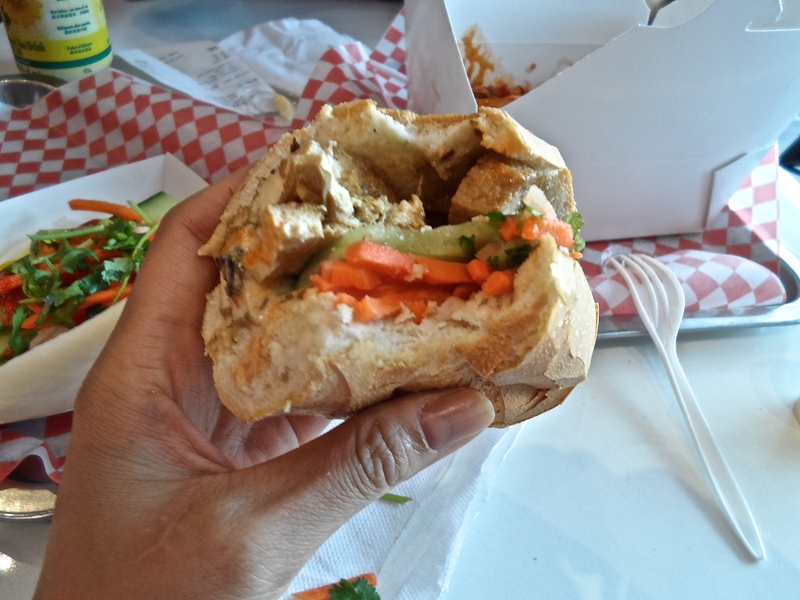 Though I get that the usual customers were probably not ordering all the items at once to taste and share, after a meal of trying all three sandwich items — banh mi, steamed bun and tacos — my mouth could not distinguish what it was invited to with the next bite. However, for all these items plus the fries, including drinks and taxes, came to about $25 CDN. Quite a deal for a very large meal for two. Grilled Chicken Banh Mi and Panko Tofu Steamed Bao. Plus, you get to sit in a small, but clean and glossy interior and not pretend to act cool siting in a rundown diner for a meal of the same price. Good thing they have a second location, fittingly at Queen street west and Spadina, right below Chinatown and in the direction of Ossington hipster coolness. I would advise that visitors drop by right before the noon hour rush (both locations open at 11 am, Monday to Saturday) or drop by during the weekends when the tiny locations are clear of office-types swooping in for their takeout orders. 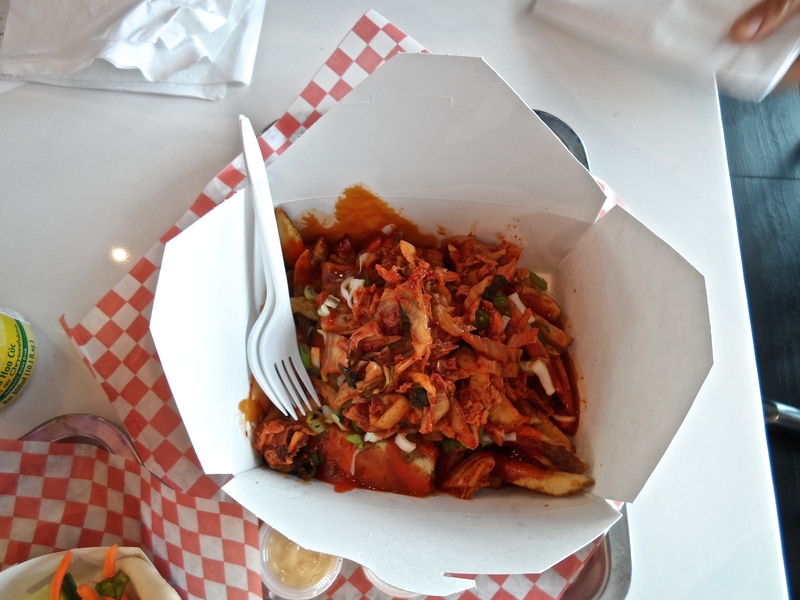 And make sure you accompany your banh mi with the kimchi fries. As well with an order of the steamed bao. And the tacos. Heck, just order everything. Hua Sang, Barrio Coreano, and more.